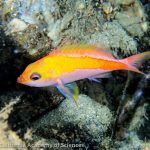 The deepwater reefs of Micronesia have yielded a pair of incredible new species from a poorly studied group known as Groppos. 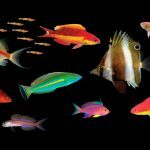 These pint-sized basslets are revered for their vibrant colors and flamboyant fin morphologies, and this certainly holds true for these newest members, both of which sport a bright yellow body accented with purple. 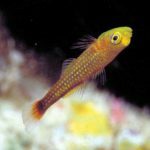 The discovery of these groppos can be traced back to the pioneering work of Brian Greene and his colleagues at the Association for Marine Exploration, who stumbled upon these new fish finds on their 2015 expedition to Pohnpei. Using rebreathers, Brian & Co. were able to survey and collect from reef habitats 150 meters below the surface, a twilight realm where few mortals dare to tread. Here, among the submerged remnants of an ancient reef, Grammotonotus dot the landscape in small harems, quickly disappearing into the rocks when approached. 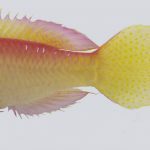 The Yellowspot Groppo (Grammatonotus xanthostigma) features a fairly unique caudal fin shape, reminiscent in many ways to some of the Cirrhilabrus fairy wrasses. 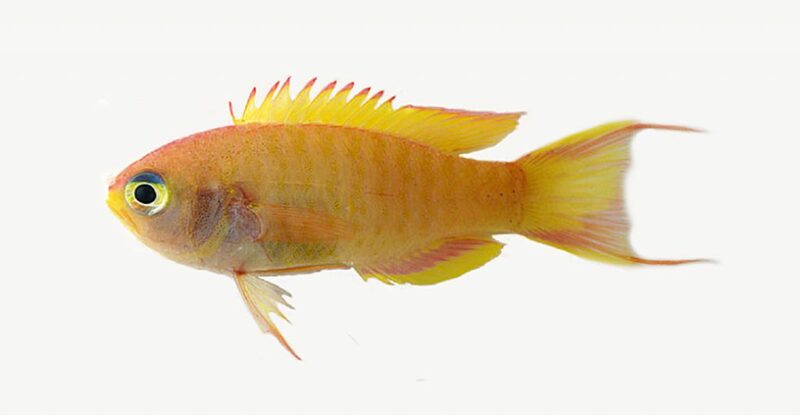 It also bears an uncanny resemblance to Brianne’s Groppo (G. brianne), another recently discovered fish collected in the Philippines at a similar depth by none other than Brian Greene. 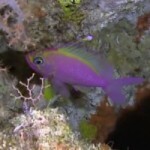 The two share a similar purple and yellow motif but can be told apart by the profile of their tails (angular vs. rounded). Though initially reported only from Pohnpei, G. xanthostigma has since been observed from American Samoa during the recent Okeanos Explorer expedition and can no doubt be expected to occur across much of the Central Pacific.